When the name of a beer is a tribute to AC/DC, then you know you are starting off on the right foot. Made with 100% Australian hops (Topaz, Galaxy, Vic Secret, and Ella) and Australian Fairview malt, this is a big 8.40% Double IPA and the final anniversary beer before the big 2-0. The Stone Anniversary IPA's are always different and interesting. Last year's was almost a hybrid "Brown IPA" which I really liked, so I am excited to try an all-Australian IPA (if you want to call it that). It poured dark yellow out of the bottle, but once rested in the glass, it was a transparent, glowing orange with less than two fingers of white head. Aroma is dank and earthy with hints of peach and lemon. Incredibly dank and hop-loaded bitterness at the front of my tongue. It has a surprisingly strong spicy hop presence to it which reminds me of Noble or Summit hops. A lot of garlic and onion that I associate with Stone IPA's is here too. On the transition in the middle and back there is a kick of peach juice which adds a nice balance to the dankness. As a Double IPA, this doesn't have the mouthfeel. It doesn't feel like an almost 9.00% IPA as it tends to be slightly thin. Nothing lingers here as the finish might be too clean and you don't get a chance to savor anything. On the plus side, there's no alcohol taste at all. 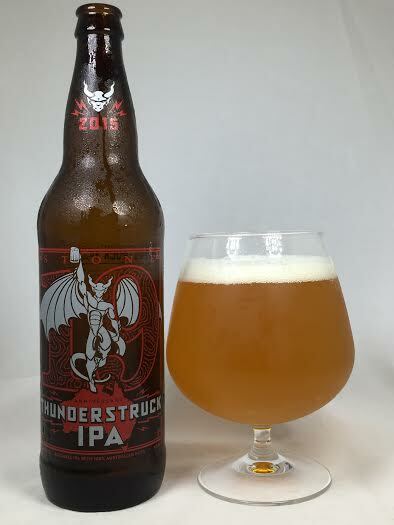 At the end of the day, Thunderstruck is a Stone IPA at heart. Big dank qualities, west coast garlic, and a transparent body all scream Stone Brewing. If blindfolded, I don't think I'd be able to definitively say this was the product of Australian ingredients as California has planted its flag with authority on this one. Maybe a redeeming stone fruit quality is here to be appreciated, but this to me is just a run-of-the-mill Stone beer. Not bad, not amazing, just exactly what you'd expect.